I first heard the story of The Littlest Angel in the 1969 Christmas Hallmark TV movie starring Johnny Whitaker ("Jody" from Family Affair) and Fred Gwynne ("Herman Munster" from The Munsters). 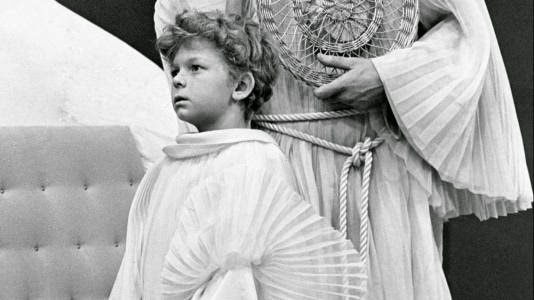 As a child I was moved by this story about a little boy who becomes an angel. In the true spirit of sharing, he wants to give a box of his personal treasures to Baby Jesus. The Littlest Angel was written by Charles Tazewell. It started as a radio play in 1939 and was first published in book edition in 1946. There are a number of picture book editions of this story, both old and new, and I always try to keep several copies on my bookshelves at Birdhouse Books. It is a sweet, nostalgic Christmas book for children. All the copies pictured here are from my store and can be found at my store link. This undated vintage edition is a board book with a die-cut window. It's really charming and unusual! This is a lovely religious Christmas story for young children. That 1961 Hard Cover Edition looks just like the 1947 hard cover edition my mother read to us the whole time we were all growing up!! I still have it put away here somewhere. I love this story as a Christmas eve reading to the "little ones" in the family - well mines a big 'un now but it's still my favorite! That is so neat - great memories! The 1961 book pictured in the blog is a newer edition of the classic 1947 book. I agree, this story makes a lovely read aloud. I have this book for sale in my store. I always pick it up when I see it. Suz, me too ... this is a book that I always try to have in the shop.